A number of indie rock elites joined forces in New York last night (December 5) to pay tribute to the late Scott Hutchison of Frightened Rabbit. 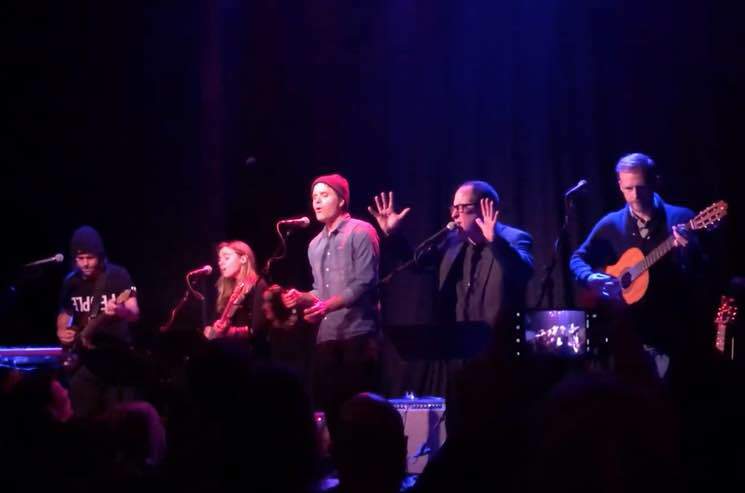 Performing as part of an event dubbed "Tiny Changes: A Celebration of the Songs of Scott Hutchison," Ben Gibbard of Death Cab for Cutie, Craig Finn of the Hold Steady, Julien Baker, Aaron Dessner of the National and Kevin Devine shared the stage at Rough Trade. In a rotating lineup that saw multiple pairings, the group performed songs like "Death Dream," "Old Old Fashioned," "Swim Until You Can't See Land," "Painting of a Panic Attack," "Keep Yourself Warm," "I Wish I Was Sober," "My Backwards Walk," "Heads Roll Off," "The Woodpile" and "Holy." Watch fan-captured footage of the performance below. Hutchison passed away earlier this year at the age of 36. As previously reported, his bandmates will play their first show together since Hutchison's death on December 9 in Glasgow.